The American Saddlebred's graceful gaits are a joy to watch, but it's careful training that makes this breed a show stopper. They are among the flashiest horses in the flashiest classes — the American Saddlebred horses in the three- and five-gaited events. Like barely controlled dynamos, they charge around the ring with high knee action, willowy necks and proudly held heads. Even casual observers unfamiliar with the breed tune into the excitement and the drama that these creatures create when they strut their stuff. 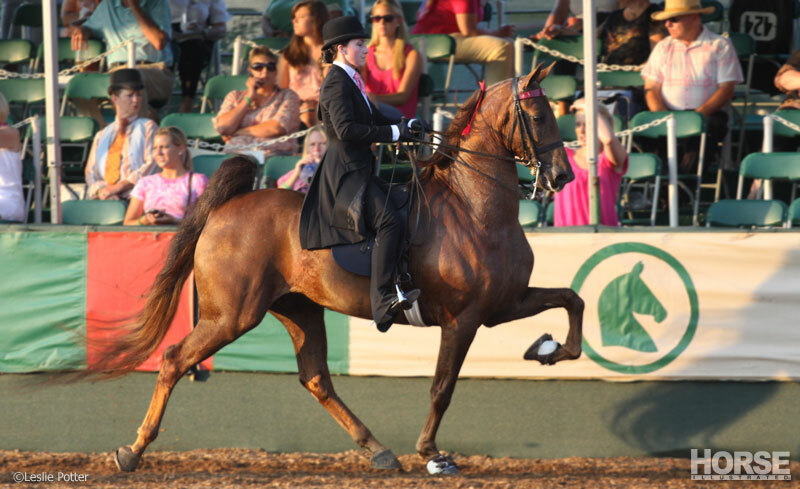 Although the Saddlebred’s conformation lends itself to these classes, it takes art, experience and a lot of hard work to transform this raw talent into championship material. The team of Ellen S. Beard and James L. Nichols understands this well. Nichols has been involved with the horse industry for 25 years as a world-champion trainer, competitor and judge. Beard, who is also a recognized judge, grew up working for a large Indiana Saddlebred farm. For 21 years she’s made a career out of instructing and training Saddlebred horses and riders. The two specialize in bringing along horse-and-rider combinations for amateur and juvenile divisions: Nichols works primarily with the horses, Beard with the riders. Since joining forces in 1991, they’ve created several national and world champions in the performance and equitation divisions. This decision is not always made just by simply analyzing conformation and way of going: Many horses need to undergo basic training — ground work, walk and trot — before a trainer can see which class the horse is best suited for. After two or three weeks, the young horse is usually ready to move on to mounted work. “We put a saddle on his back and lead him around a little bit to get used to the different equipment,” says Nichols. “When he’s settled with that, we’ll ease somebody on his back, then lead him around for about five minutes or so, taking this process really slow to make him understand that nothing is going to hurt him. If everything seems to be going okay, we’ll turn him loose and start working on the guiding and signals that the rider will be giving him.” Once the horse is comfortable with a rider, he’s ready to move into three- or five-gaited training. Training the three-gait begins with simultaneously teaching the trot under saddle and with a cart. “Jogging in the cart teaches your horse to go forward in a straight line because he’s between the shafts of the cart,” says Beard. “Going forward is the most important thing you can do with a horse.” Working in a cart also gives the horse a break from mounted training, keeping the young mind fresh, and it provides good conditioning without stress. To accustom the horse to the cart, assistants at the horse’s head lead him around while others follow the cart to keep it from twisting and scaring the young horse. Once the horse is comfortable pulling the cart, Nichols asks for a trot by clucking, gives a little bit of line and lightly slaps the line on the horse’s back. Helpers at the head encourage the horse to move into a trot and discourage him from breaking into a run. From the saddle, Nichols asks the horse for a trot by similar means: clucking, lightening up on the mouth, sometimes tapping a rein on his back and applying pressure evenly with both legs. Other aids include “whoa” plus taking back to stop; “whoop” in tandem with lightly taking a hold of the reins or lines to slow; and “cluck” coupled with lightening the mouth, applying a little leg and a tap on the side with legs or lines to quicken. After the horse is trotting reliably, usually within three months, Nichols begins teaching him to canter under saddle. By clucking and thumping the sides, the horse tends to break into a canter. The first few times, the young horse may canter quickly, but with time, he settles down into a more manageable gait. This contrasts with hunters, which have rounded backs, lower heads and move in a horizontalplane, and with Quarter Horses, which appear to pull themselves into the canter from their front ends. “You want Saddlebreds to step into it from the back end,” emphasizes Beard, “because if they don’t, they’ll lose their elevation.” Horses generally learn cantering under saddle in about a week. “From there we start putting the finish on the gait,” Nichols says. “I begin stressing the proper way to start as far as leg position, the correct speed he needs to be going, stopping and things like that.” Nichols also works on transitions — canter-walk and canter-walk-trot — to help the horse fully understand and respond to signals. Nichols takes his time with this step. “This is pretty crucial because the horse has to do this throughout his life,” Nichols points out. “We want him to learn the proper way of doing it and how to respond to it; we don’t want him fighting the bridle at all.” Some horses may take up to six months to adapt to the full bridle. It generally takes about a year to finish a horse for three-gaited classes. To put the youngster into a slow gait, Nichols starts him at a walk, elevates his head by lifting the horse’s mouth, subtly wriggles the bit in a slight back-and-forth motion, clucks and pushes him forward with his legs. “This gets the horse a little off balance, so he’ll start ambling a little bit, which is the start of slow gaiting and racking,” Nichols reports. Working where there’s a bit of a downhill grade also helps put the horse off balance and into an amble. As the horse becomes consistent at the slow gait, Nichols moves him up into the rack. He starts with the slow gait, then clucks, wiggles the bit and presses with his legs to ask the horse to step up a little faster, producing the rack. When the horse understands how to move into the rack, the next stage is perfecting the speed and consistency of the slow gait and rack. Nichols often works outside where there is room to move in a straight line. “I won’t attempt to get them around a turn at this point,” he says. “I let them learn to go in a straight line, then I’ll start making diagonal lines, teaching him to follow my lead of where I’m telling him to go. As he gets pretty solid in his guiding, I start teaching him to get around the turn.” Nichols says it takes about 10 to 12 months to finish the rack. After the horse learns to slow gait and rack, Nichols teaches the horse to canter, using the same methods as he did for three-gaited horses. “When we first start training,” Nichols says, “I’ll canter him a time or two just so he’ll have that thought pattern in his mind a little bit. But I don’t spend much time cantering, because when I go to slow gait and rack him, I don’t want him to break to a canter.” To produce a five-gaited show horse from a green horse generally takes from 12 to 18 months. A year or more of training may sound like a long time, but as tempting as it may be to rush a horse through training, the effect won’t be the same if the horse is pushed for faster results. 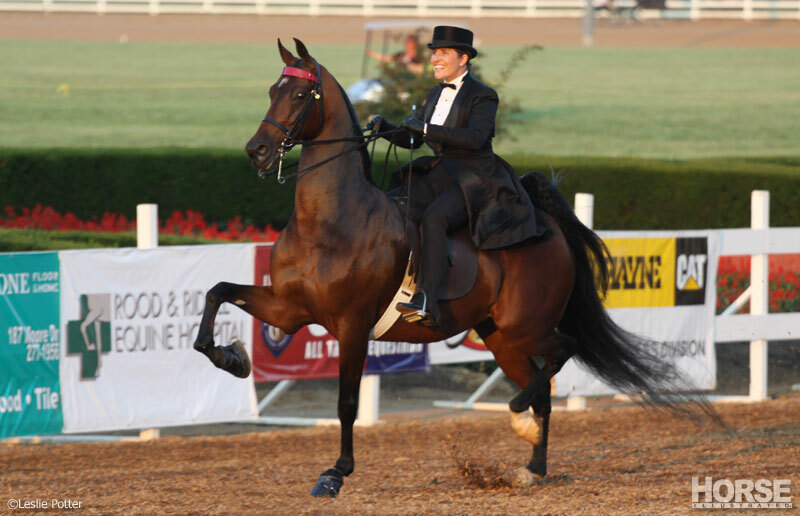 The high leg action of the three-gaited horse and the two man-made gaits of the five-gaited horse make these two disciplines more difficult and time consuming for a horse to learn than more traditional gaits. Even when he is working with 3-year-olds, Nichols says he limits the horses’ workouts to 15 to 30 minutes. He also continues to include a lot of walking and perfecting of very basic elements in their training. I am 68 years old I was never so pleased as I was tonight. The under standing was made so simple,I will never be so gratefull as I am to night. I just returned from visiting the Kentucky Horse Farm in Lexington, KY. I learned a lot there especially in the 2 museums. This article about the gaits was very helpful in completing my scrapbook pages of our trip. I ride the American Saddle Bred. In my opinion thier the best breed! I mostly ride three gaited horses, but five gaited horses have some of the smoothest gait. The slow Gait and rack are the most smoothest gaits i have ever ridden. Well I have never racked but have slow Gaited many times. If you ever get the chance to ride a saddlebred, you will see how smooth they are! AWESOME! We want more! There are not really very many books written on training saddlebreds or some of their “foreign” equipment used to train. I own a Saddle Bred, but I have never gotten him to rack. (at least I have never noticed him racking, but I might just not reconize it). He does have the rocking-horse canter, and the smooth trot. I want to know more about this so I can have a gaited horse who can actually rack! I have an American Saddlebred showing in Hunter divisions. He does not move like a hunter, thus rarely pins in hack (flat) classes, but what a grand jumper he is. I have recently purchased a new 5-gaited mare and am just starting to learn how to ride her. this was very helpful. Wait a second, the way this article reads, they’re putting saddles and mounting up on yearlings! Tell me I misread “the fall of their first year” and that actually means they’re older than one year old! I’ve never met a Saddlebred I didn’t like. They are absolute mind readers, at once proud and gentle. Though I admire all aspects of equine sport, riding a five gaited horse is an extreme pleasure. This article is wonderful in its explanation of how Saddler trainers get the job done. Western horse lovers have so many “how to” articles from which to gather information, so many clinics,etc. that it’s a grand idea to get the basic training plan for young Saddlebreds out there in plain, simple language for all to see. Thanks! excellant article; As a lifetime member of american quarter horse association for over 30 years, I welcome the change. The saddlers look so alive and beautifull. They may not be sorted but the one in the second photo has some pretty strange looking front feet.